Originally published by Paris-Luttes. Translated by Enough is Enough. 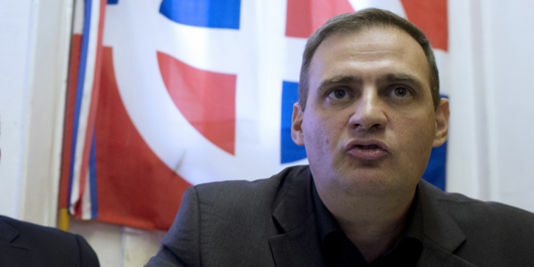 Later people found out that the person who was kicked the most was actually Yvan Benedetti, a convinced Nazi and militant of the Parti Nationaliste Français (PNF) (In English: French Nationalist Party, EIE) , an anti-Semitic and racist group . Present at demonstrations since the beginning of the movement, this antisemitic scum has therefore suffered a first setback. It is important that this individual can no longer express himself during the demonstrations for the sake of the movement. Former Front National (FN), he became the leader of L’Œuvre française (The French Work, EIE), one of the oldest racist and anti-Semitic groups, a promoter of a French fascism, a collaborationist, dissolved in 2013. Read his article (French) by La Horde. The Movement as Battleground: Fighting for the Soul of the #YellowVests Movement – Enough is Enough!